Perhaps you’re young, confident and maybe a little bit rash, and you’ve been dying to take your bike out for a long excursion. So you’ve decided to take an impulsive trip and are looking for some last minute tips. And that’s fine. There’s freedom in picking up your bag and heading out for an adventure just because you feel the call of the road. Or maybe you’re the responsible type. You’ve been planning this road trip for months, even years. Finally, after waiting for all the pieces to come together, the time to go is finally near. You’ve got your destinations lined up, your hotel rooms reserved, and you’re researching advice online to make sure you haven’t overlooked anything. Whatever the case, whether you’re planning to travel with your motorcycle stateside or in another country, you’ve come to the right place. The first thing you should know is to expect the unexpected, especially if this is your first time doing a solo motorcycle road trip. There are some things you can only learn the hard way, by facing obstacles head on and overcoming them. That being said, these 10 tips will help you mentally prepare yourself for the challenges ahead. If you’re not accustomed to riding for more than just a few hours, then you may want to make some practice runs lasting a few hours before embarking on your trip. The road will test your focus, your endurance, and literally be a pain in the rear. The more experience you have riding for longer periods of time, the more pleasant your road trip will turn out. Right now you may be thinking that windshields are unstylish and only fit for middle-aged men riding overly outfitted touring bikes, but you’ll change your mind fast once you’re on the freeway for a few hours. Riding against the wind at 65 to 80 miles per hour gets exhausting fast. If you don’t have a windshield already, do yourself a favor and invest in a proper windshield. Unless you’ve had a lot of experience riding long distances, you may not realize how essential posture is to comfortable riding. Getting your seating and riding position right makes the difference between smooth sailing and killing your back and legs. If you want to ride without turning your body into a pretzel, seriously consider getting a backrest and some highway pegs. Also adjust your handlebars for optimal comfort before you hit the road. 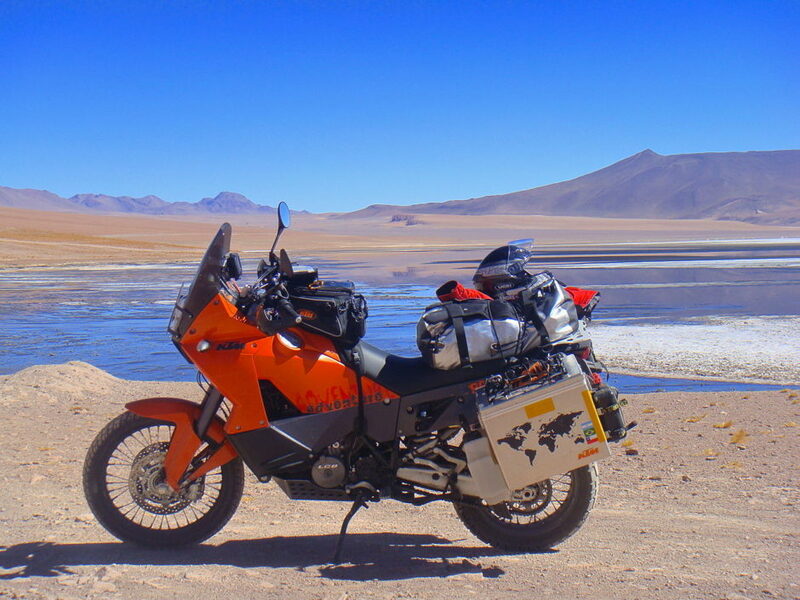 Riders in the know often joke that on a long road trip you’ll end up hot, cold and wet. Expect to encounter all kinds of weather conditions, whether it be hot sun or cold rain—and prepare yourself accordingly. Pack a few change of clothes and wear well-ventilated, waterproof equipment. However, no matter how many preparations you make, you should steel yourself for at least a little discomfort. After all, you’ll be on a motorcycle, completely exposed to the elements. According to the National Institute for Occupational Safety and Health (NIOSH), noise levels of 100 decibels become damaging to the ear after just 15 minutes of exposure. At a speed of about 74 mph (which is common for freeway riding), wind noise exceeds 100 decibels. The conclusion? Wear earplugs while riding, no matter how uncool it is. You know what’s not cool? Losing your hearing. Also, contrary to popular belief, earplugs don’t block out sound, they help your ears distinguish sounds better. In other words, you’ll be more aware of your surroundings with earplugs, not less. And as any good rider will tell you, awareness is key to safe riding. There’s something romantic to the notion of riding with only the road and your thoughts on your mind for hours on end—and it’s an experience any rider should have at least once. However, you may want to consider using technology for your first trip since it will make your ride a lot more comfortable. A helmet with Bluetooth capabilities, for instance, can facilitate navigation and rider-to-rider communications. If your bike has cruise control, make use of it. It’ll help you maintain a constant speed for long periods of time and consequently discourage cars from dangerously passing you. Riding long distances is a physically and mentally draining experience, and you’ll have to listen to your body if you want to make it through your trip unscathed. Feel thirsty? Pull over and drink some water. Hungry? Pull over and get a snack. Your muscles feeling tight? Pull over and stretch. The last thing you want to do is overdo it, lose concentration and put yourself at risk of a bad motorcycle crash. Remember, every car is a potential killing machine, and you need to be awake, alert and focused on your ride from point A to B to C and so on. One last and final tip: enjoy yourself. As long as you practice smart and safe riding strategies along with the tips above, you will have the time of your life, guaranteed. Now get out there and create some unforgettable memories! The road awaits. The Best Beaches in Miami! Posted in Budget Travel, Destination, USA and tagged with Attorney, Lawyer, motorcycle. RSS 2.0 feed. « Are tours the safest way to travel?